"In 1903, at the age of 20, Barbier settled in Paris. He was a close friend of Claude Monet and Claude Debussy. His early works had depicted Arras, his birthplace, already revealing his love of flowers. Once in Paris, he painted many views of the Seine, the quays, Notre-Dame and the Jardin du Luxembourg. Going outside Paris, he painted the nearby La Frette and St-Germain-en-Laye and the more distant Barbizon, Étretat, Honfleur, La Rochelle and the Côte d'Azur. Later he visited Italy and particularly Venice. He was a man of broad interests including music, astronomy and photography. 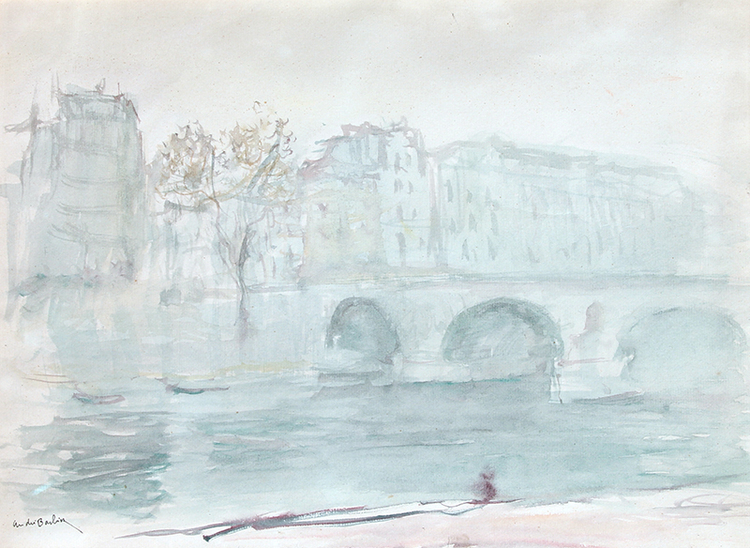 His painting reveals clearly his admiration for the work of Claude Monet, more specifically Monet's views of London and, from that, Turner's paintings of mist and fog. However, these influences did not result in mere imitations: his works showed a deep understanding of the subtleties of Impressionism and his own personal sensitivity to the play of light and shade, variations in the resonance and iridescence of colour according to time of day, atmospheric conditions, season and place. "He exhibited in Paris at the Salon des Indépendants from 1903 to 1914 and then again in 1967, 1969 and 1970, at the Salon d'Automne in 1909 and 1938, at the Salon de la Société Nationale des Beaux-Arts in 1911 and at the Salon des Tuileries between 1924 and 1931. He participated in the 1937 Exposition Internationale in Paris. His solo exhibitions in Paris included two at the Galerie Durand-Ruel in 1944 and 1964 and, after his death, at the Galerie Jacques Massol in 1989 and at the Louvre des Antiquaires in 1990" (Benezit, Dictionary of Artists, Gründ, 2006). Please contact us if you are interested in selling your André Georges Barbier paintings or other artwork from the 19th century and early 20th century.